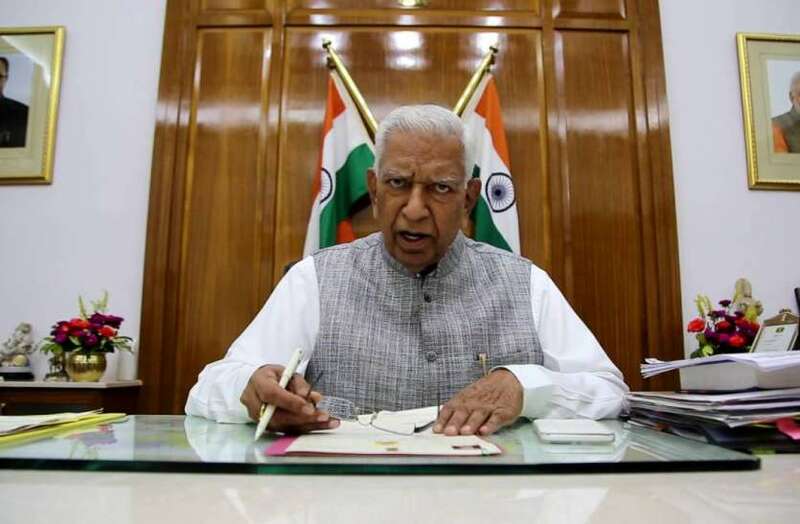 Stuck in a situation where's he's caught between loyalty and constitutional responsibility, 80-year-old Vala has had a long political career where he has proven to be indispensable to the BJP many times over. 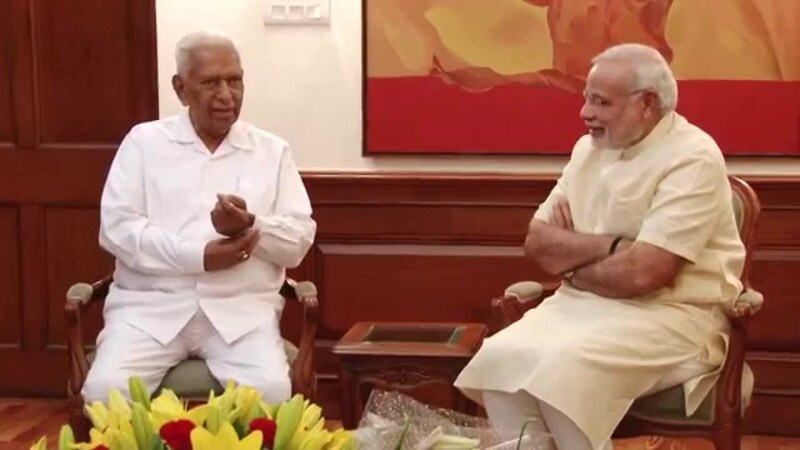 New Delhi: The man who holds the strings of Karnataka currently is Vajubhai Vala. Ever since the Congress-Janata Dal(Secular) post-poll coalition has staked claim to form government in the state, people have been keenly watching the moves of Vala, an old Rashtriya Swayamsevak Sangh (RSS) worker and multiple-term minister in the Gujarat state cabinet before he was appointed by the Narendra Modi government to take charge as the governor of south India’s largest state. Now, in the latest, despite the Congress-JD(S) combine submitting a list of 117 MLAs to back H.D. Kumaraswamy’s claim to form the government in the state, Vala late Wednesday night invited BJP leader B.S. Yeddyurappa to form the government. Yeddyurappa now has 10 days to prove his majority on the floor of the assembly. Vala, 80, started his political career from Rajkot, the business hub of Saurashtra, in the early 1970s when he, as a 26-year-old, joined the Bharatiya Jana Sangh, the earlier avatar of the Bharatiya Janata Party (BJP). Although he participated in the Jayaprakash Narayan-led anti-corruption movement for a while, he never played a prominent role. It was in the late 1970s when he truly became active in politics and rose to prominence in Rajkot. A journalist in Rajkot recalled that Vala was elected as a corporator in 1975 but he was noticed by the state BJP leadership only when he successfully broke the Congress’ stronghold in cooperative banks and societies in the city. His ability to connect with people through his oratory skills, which often were laced with interesting anecdotes and his trademark Kathiawadi wit, and self-effacing demeanor soon propelled him to a position of influence. He already had the backing of the RSS, of which he was associated from his days in school, and his sizeable community, the OBC Karadiya Rajputs. Eventually, he became the mayor of Rajkot in 1983 and that set him off for greener pastures. In 1985, he went on to win the assembly election from Rajkot West, a seat he retained for seven consecutive terms. His accessibility to common people is what made him a state-wide BJP leader. As a result, the his party adequately rewarded him with important portfolios in BJP governments. He served as finance and revenue minister in Gujarat from 1998 to 2012, following which he was nominated as the speaker of the assembly. What is noteworthy is that he was perceived as a staunch supporter of Keshubhai Patel, who was the BJP chief minister from 1998 to 2001. However, when Narendra Modi was parachuted from New Delhi to take over as the chief minister after a rebellion in the BJP’s ranks, he vacated his Rajkot seat for him to contest. This brought him into the good books of Modi, under whose chief ministerial tenure Vala served as the finance minister for nine years. Although many who were considered Keshubhai’s supporters were shunted out during Modi’s leadership, Vala remained one of his close aides for the entire 13 years he served as the chief minister. In his long political career, Vala has occupied important positions even within the party. He served as the president of BJP’s state unit of Gujarat. After his stint as a minister ended in 2012, he became the speaker of the assembly until 2014. Most who know Vala said that he has been one of the best speakers the state has had after Kundanlal Dholakia and Ashok Bhatt. However, as his businesses grew alongside his political standing, he started to face the charge that he was using his position to garner personal profits illegally. “It is widely considered that he has big interests in the real estate sector in Rajkot and Ahmedabad regions. It has also been alleged that in every prime property that was built in the last decade, Vala had a share in it although not directly. Around 10 years ago, his apparent involvement was discussed in a share market scandal in Ahmedabad. However, I must add that none of these charges has been established,” said the senior journalist. However, his indispensability in the party remained undisputed as the BJP leaders saw him as a “crisis manager” of the party. “Both BJP workers and leaders would often approach him in times of trouble. He would help them in personal crises. As he kept growing in seniority, he became the go-to person for the national leadership to solve party conflicts,” a farmer leader associated with RSS said, adding that he knew how to keep even his opposers happy. Interestingly, Gujarat’s current chief minister, Vijay Rupani, too started out as a corporator and then became mayor of Rajkot. He has occupied the Rajkot West seat after Vala retired from active politics. Despite a great degree of anti-incumbency working against him and having faced a stiff competition from his Congress’ opponent Indranil Rajyaguru, Rupani could still hold on to the seat. Much of the credit goes to Vala who converted Rajkot West into one of the safest seat for the BJP over his long political career. Soon after Modi came to power at the Centre, Vala was rewarded with the governorship of Karnataka. There is a running joke in Gujarat that Vala, a crowd-puller, is having a hard time in Karnataka without an opportunity to use his Kathiawadi wit and humour in the Kannada-speaking state. Perhaps, it is this discomfort that landed Vala in a controversy in 2016. He humorously urged college-going girls to give up “fancy clothes and lipstick” as an education institute, he thought, was not a platform for a “beauty contest”. “Both girls and boys are intelligent…To achieve something in life you need to sacrifice something. Boys have to give up their specific addictions. Girls need to give up their fashion. You (girls) come to college for studies and not to participate in any beauty competition. You (girls) don’t need to get your eyebrows done, apply lipstick or trim your hair…” he said in 2016 while delivering the valedictory address of the 103rd Indian Science Congress in Mysuru. His comments were widely panned by women’s rights groups. Today, however, he is definitely faced with a complicated situation of a different scale. His office and loyalty to the Sangh parivar are in conflict. BJP’s national general secretary, Ram Madhav, recollected in a Facebook post that when Vala was the BJP state chief in 1996, it was H.D. Deve Gowda, who as the then prime minister, had dissolved a BJP government. Did he mean that it was Vala’s turn to get back at Deve Gowda’s son H.D Kumaraswami, who has staked claim for the chief minister’s position in Karnataka? He doesn’t make that clear. With him inviting Yeddyurappa to form the government, he has made his choice clear between constitutional responsibility and party loyalty.